Tree cutting can be a challenging and potentially dangerous business – which is always best handled by professional tree surgeons. Much may depend on the position of the tree – whether it is causing an obstruction, involving branches that have encroached too close to a building or even posing a danger. This may determine whether the tree needs to be completely removed or cut back and retained. In any eventuality, if it’s a tree cutting service you need, then The Original Tree Surgeons are here to provide it. Based at Hadlow, near Tonbridge, we cut down trees of all sizes for residential and commercial clients around Sevenoaks &amp; Tunbridge Wells as well as further into Kent, East Sussex, Essex and Greater London. 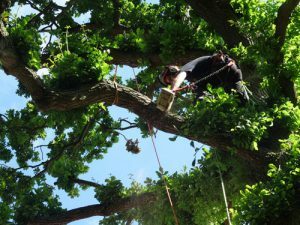 Fully insured and with decades of experience in the tree cutting business, The Original Tree Surgeons will deliver quality workmanship carefully, safely and tidily – regardless of the environment in which we are operating. It may also be necessary to check whether any local authority or special permissions are required before any tree cutting takes place. Again, we can provide advice and assistance to ensure all guidelines are met. Before any tree cutting is carried out, we will always undertake a free site visit to determine the best course of action and provide a quotation. For a professional tree cutting service, delivered by our fully qualified team of surgeons, contact The Original Tree Surgeons on 01892 599331.